Norway offers visitors an incredible mix of cultural and natural wonders. From cosmopolitan Oslo to its endless snow-capped mountain peaks and deep fjords, there's no end of choices for travelers in the land of the midnight sun and stunning northern lights. Getting around the country is easy, and the country's top-notch transit systems offer some of the best sightseeing opportunities, too, whether by rail or the fantastic coastal steamers. One of the world's most prosperous nations, Norway seems to have a fascinating museum for just about every important aspect of its rich cultural and social history, covering everything from the Vikings to seafaring and fishing, as well as art and entertainment. Norway is also rich in spectacular scenery, from its stunning fjords to its spectacular mountains and glaciers, many of which are easily accessible to tourists. Plan your sightseeing excursions with our list of the top-rated tourist attractions in Norway. The largest of Norway's fjords, Sognefjord reaches 204 kilometers inland and branches off into smaller inlets and fjords along the way. At its widest, it is almost five kilometers across, and the cliff walls reach as high as 1,307 meters, making a breathtaking sight. The most popular way to visit the fjord is by boat, and fjord cruises and sightseeing tours are plentiful, many of which depart conveniently from Bergen. Tourists will also enjoy exploring the narrower branches like Naeroyfjord, a spectacular 17-kilometer stretch with cliff walls that are only 250 meters apart and tower more than 1,700 meters above the water. Another top destination is Fjærland, the region that houses Europe's biggest glacier, Jostedalsbreen, and the Norwegian Glacier Museum. A tourist attraction best suited for the active traveler thanks to the arduous journey required to get there, Pulpit Rock is nevertheless one of the most popular sights in Norway. Located near Stavanger, the destination requires ferry and bus rides and then a two-hour uphill hike to reach the almost perfectly flat-topped cliff, which looks over Lysefjord, more than 600 meters above the water. Those visiting the Stavanger area will also want to stop by the surprisingly fascinating Norwegian Canning Museum, which is set up as the cannery was during WWII. Stavanger Cathedral is also a top tourist attraction in Stavanger. This 12th-century structure features multiple styles, including a Romanesque basilica, a Baroque pulpit, and a Gothic font. Situated 349 kilometers north of the Arctic Circle, Tromsø is best known for its important role as the base for many major Arctic expeditions since the mid 1800s. The area was first settled in the 13th century as a fishing village, and the industry has been an integral part of life here, contributing to the area's maritime charm. Also a result of its northerly position, Tromsø is a top destination for those hoping to see the spectacular aurora borealis, or northern lights. Tourists will find multiple attractions in town that explain and explore the phenomenon, including Polaria and the Polar Museum. An unexpected tourist attraction for an area deep within the frozen north, the Tromsø Arctic-Alpine Botanic Garden is home to a plethora of flowering plants, including hardy rhododendrons and the gigantic Tibetan blue poppy, as well as a garden dedicated to the region's traditional medicinal plants. The Lofoten Islands form an archipelago off the coast of northwestern Norway and are a popular tourist destination for Norwegians and foreigners alike. Thanks to the Gulf Stream, the weather here is mild despite its location within the Arctic Circle. Tourists come here to enjoy the beaches, explore traditional fishing villages, kayak, hike, and see the wildlife. These islands are also one of the best places to visit for a glimpse of the northern lights. There are plenty of attractions and things to do on the islands, especially in Svolvaer, which is the largest town, located on the southern coast of Austvågøy island. Here, you will find the Lofoten War Museum with its World War II collections, and the unique Magic Ice, which displays ice sculptures depicting local life. The Lofoten Museum, which explores the history of the island's fishing industry, is also located on Austvågøy, as is the Lofoten Aquarium, which features Arctic sea life. Tourists can learn even more about the importance of fishing at the Norwegian Fishing Village Museum and the Lofoten Stockfish Museum, which are both located in the town of Å. The largest of Norway's museums dedicated to their seafaring ancestors, the Viking Ships Museum in Oslo features three 9th-century Viking vessels, each of which had been laid to rest as burial chambers for prominent Vikings. The largest of these is the 70-foot Oseberg Ship, built around AD 800, which contained a chieftan's wife and two other women along with many items that give insight into Viking life. The museum is also home to the Gokstad Ship, which is an impressive 23 meters long, and the Tune Ship. Visitors can also view several exhibits and films, which focus on the importance of maritime life for that culture. The Viking Ships Museum is operated by the Museum of Cultural History, as is Oslo's Historical Museum, which contains artifacts from around the world and throughout history, from Egyptian mummies to the history of gold coins. This museum is also home to an expanding Viking Age exhibit, which contains a rare well-preserved Viking helmet. Oslo's Bygdoy Peninsula is a suburb located only four miles west of the city, easily reached by car or public transportation. It is home to several of Oslo's top tourist attractions and also known for its natural spaces including beaches, parks, and forests. Among its numerous museums, the Bygdoy Peninsula is home to the Center for Studies of Holocaust and Religious Minorities in Norway located in Villa Grande. Another top museum is the Fram Museum, which houses the ship Fram, known for its Polar voyages, and Gjøa, famous for being the first ship to navigate the Northwest Passage, and the popular Kon-Tiki Museum is just next door. This area is also home to the Norwegian Maritime Museum, which explores the role of fishing and other maritime activities in Norwegian life. One of the most popular sightseeing opportunities in Bergen is the Bryggen Hanseatic Wharf, a vibrantly painted area, which was once the center of trade, dominated by Hanseatic merchants. Tourists can find several historic buildings, which portray life during the Middle Ages, as well as boutiques, restaurants, and the Bryggen Museum. Learn even more at the Hanseatic Museum, which has been open since 1872, housed in Finnegård, a 1704 home, which was owned by one of the merchants. While in Bergen, visitors will also want to visit Troldhaugen, the former home and workspace of composer Edvard Grieg, as well as the Open Air Market. Tromsø is home to several fantastic museums, two of which are dedicated to studying life in the far north. Polaria is the newest of these, home to exhibits about the aurora borealis (northern lights); the effects of climate change on Arctic ecosystems; and Arctic wildlife, including an Arctic aquarium. The Polar Museum focuses on the area's long history as a fishing community and its more recent status as a primary research base for polar studies. Exhibits include the findings of more recent expeditions and scientific studies, which delve into the world of the dark and cold deep sea of the Arctic. The Vigeland Sculpture Park is one of Oslo's top tourist attractions, home to 650 sculptures created by Gustav Vigeland. These sculptures, which are formed out of wrought iron, bronze, and granite, are arranged in five themed groups. The most famous of these are in the fountain group, which depicts the cycle of human life, culminating in a 16-meter monolith. This collection is found within the large Frogner Park, which also houses the Vigeland Museum and the Oslo City Museum, as well as numerous recreational facilities, including Norway's largest playground and an expansive rose garden. The Akershus Fortress is a medieval castle commissioned by king Håkon V in 1299, later turned into a Renaissance royal residence by king Christian IV in the early 17th century. It sits on a promontory overlooking the Oslofjord, and the grounds have spectacular views over the harbor. Guided tours are available during the summer, and you can also find the Museum of the Norwegian Resistance on the castle grounds. History buffs may also want to check out the Norwegian Armed Forces Museum, which displays weapons and exhibits illustrating Norway's military history. The fortress grounds also provide a lovely backdrop for events including public ceremonies, concerts, and shows. 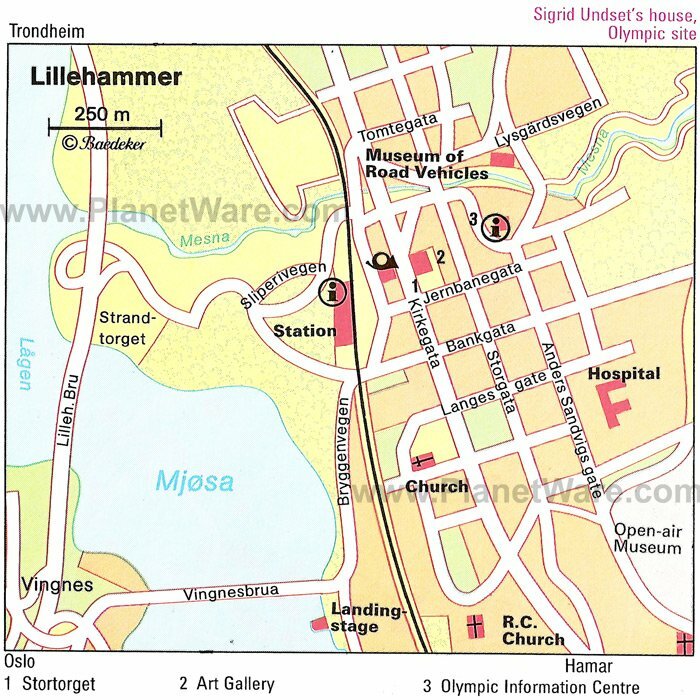 Located above Lake Mjøsa at the south end of the Gudbrandsdal valley, Lillehammer is one of Norway's best-known year-round tourist destinations. In summer, it's all about attractions such as Malhaugen Park, an open-air museum consisting of more than 100 historic buildings, including 18th-century farmhouses, workshops, and a stave church. Another notable landmark is Peer Gynt's Cottage. Dating from the early 1700s, it's said to have been the home of the prototype of Ibsen's famed hero. But it's when the snow flies that Lillehammer really shines. Host to the 1994 Winter Olympics, the city's list of winter activities is endless: skating, curling, sleigh rides, more than 480 kilometers of Nordic ski trails, as well as alpine ski centers. Part of the spectacular Fjord Norway network - and regularly topping the UNESCO World Heritage Sites list - the Geirangerfjord region north of Ålesund offers some of the finest scenery anywhere in Norway. The eastward continuation of the Sunnylvsfjord, the Geirangerfjord boasts some of the country's most spectacular views. One of the best is from the summit of Dalsnibba. At 1,495 meters, the views of the surrounding mountains and the Geirangerfjord far below are simply breathtaking. Numerous cruises and tours are available, but if you're driving, be sure to take the winding Eagles' Road with its 11 hairpin bends and great views. There's no better way to see Norway's stunning countryside than by train. Perhaps surprisingly for such a mountainous country, Norway's rail lines stretch more than 3,218 kilometers, encountering along the way some 775 tunnels and more than 3,000 bridges. The best scenic routes begin in Oslo, including the Bergen Railway, which runs over the Hardangervidda mountain plateau. Other routes of note are the Dovre Railway from Oslo to Trondheim with its sideline, the Rauma Railway, between Dombås and Åndalsnes, and the famous Flåm Railway, the world's steepest. Norway's rail network also offers a number of other interesting diversions, such as classic steam trains, gourmet train excursions, and pedal-powered rail tricycles ("draisines") for use on abandoned rail lines. The Atlantic Ocean Road - one of 18 National Tourist Routes in Norway - is not only a vital connection for the maze of tiny islands it serves, it's also a lure for anglers, diving enthusiasts, and visitors wanting to get as close as possible to the sea. Although just over eight kilometers long, it has gained a reputation as one of the most spectacular stretches of coastal highway in the world, weaving through an archipelago in Eide and Averøy in More og Rømsdal. In addition to the excellent views - always spectacular, whatever the weather - you'll get a chance to visit lovely little fishing villages, quaint wooden churches, and the famous Trolls' Church Cave. Several sites specifically geared to tourists have also popped up, including restaurants and resorts, as well as fishing excursion operators. The largest Alpine region on the Norwegian high plateau, the Jotunheimen covers an area of 3,499 square kilometers and includes Scandinavia's highest mountains. It's also home to many spectacular waterfalls, rivers, lakes, glaciers, and wildlife, such as large reindeer populations. Two of this national park's mountains rise to heights of more than 2,438 meters, the highest being Galdhøpiggen. Despite its tremendous height, Galdhøpiggen can be climbed in about four hours. Although a guide is required, the incredible views over rocky crags and fields of ice from the summit make it money well spent. Another four-hour climb in the Hurrungane group is to the 1,349-meter Skagastølsbotn and the Skagastølsbre glacier. Northern Lights and the Midnight Sun: For those who want to venture north of the Arctic Circle, the reward is a chance to see the legendary aurora borealis and, during the summer, the midnight sun. The northernmost city of Tromsø is perhaps the best place to start, convenient for its frequent ferries, although a trip to the Lofoten Islands is a great option for nature-lovers. Norway's Swedish Neighbors: Sweden, which borders Norway to the east, has many cities worth visiting, most notably historic Stockholm. Nearby Uppsala is known for its university and a lovely 13th-century cathedral. There are many other popular places to visit in Sweden, including Malmö, which connects to Denmark via the Oresund Bridge, as well as the upscale vacation island of Gotland, often referred to as the "Long Island of the Baltic."